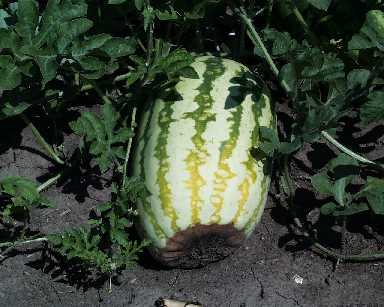 Watermelons are attacked by Fusarium wilt at all stages of development. Seeds may decay in the soil. Seedlings wilt collapse and die before or after emergence. Older plants wilt, wither, and die any time during the growing season. If melons do form, they are generally small and unpalatable. Wilting of runners usually progresses slowly, showing initially during the midday heat . Such plants recover at night, but after a few days they wilt permanently and die. Favored by soil temperatures around 80 F, a low soil pH, Fusarium wilt is more common in southern latitudes. Anthracnose is a Very destructive disease of watermelons and other curcubits. Anthracnose attacks all above-ground parts of the plant. Watermelon can be infected at any stage of development, however, disease symptoms are first noticed as round to angular reddish brown spots on older leaves. Spots may later dry, turn almost black and tear out, giving a leaf a ragged appearance. Often the leaves at the center of the plant are killed first, leaving the stem and a portion of the runners bare. Causes damping off, crown rot, leaf spot, stem canker, and fruit rot of watermelons. Lesions on the cotyledons and leaves are round or irregular and brown in color. Lesions on the crown and stem are brown and turn white as they age. Early infection usually comes from diseased seeds. As the season advances, gummy stem blight attacks vines causing elongated, water soaked areas that become light brown to gray. Cankers are most common near the crown of the plant. Gum oozes from the stem cracks, and runners usually die one at a time. Gummy Stem Blight generally does not cause fruit rot in watermelons. Caused by two distinct viruses referred to as Watermelon Mosaic Number I and Watermelon Mosaic Number II [How clever!]. The most common symptom is mottling of the leaf, some plants are stunted with abnormally shaped leaves. The diseases is usually spread by aphids which can spread through an entire planting during the growing season. Nematodes - microscopic worms which live in the soil and feed on the host plants roots preventing the the plants from taking up the nutrients they need to grow . Some forms of nematodes are highly beneficial , while others can wreak total destruction . Tomato plant nematodes are prevalent throughout North America, but they are most damaging to tomato plants in the Southern regions of the US. Hot Pepper Wax repels bugs from your plants, fruits and flowers. 100% natural spray uses pepper extract and wax to effectively discourage pests. Helps to reduce stress on cuttings.